SpicyNodes turns complex information into a richly interactive content portal, and can help your visitors explore your museum collections virtually. Your exhibits are meant to be visually savored. With an inviting interface, SpicyNodes nicely complements search engines or other methods of browsing. Information is organized into what we call “nodes.” Visitors can adjust their focus, exposing more information (images, videos, text) in a node, or zoom out for a broader view. For example, visitors to a virtual art collection could drill down to Impressionists > Monet > Water Lilies with a few easy, fun clicks. With a few clicks (or taps), visitors can fly to hundreds or thousands of objects in your collection, or to concepts and descriptions. These nodes can contain text, images, audio, YouTube video, and other Flash components, as well as link to your existing web pages. It’s an intuitive and multifaceted way to browse a collection. Best of all, SpicyNodes can grab data from collection management software via a simple XML interface. Give SpicyNodes a taste test for free. Start by reading about the XML syntax, then import any XML file for testing. Alternatively, please contact us if you would like free, temporary access to the Enterprise API to run a complete test. SpicyNodes currently works online, but we’ll soon release a version for the iPad that uses the same XML file as the web-based deployment. 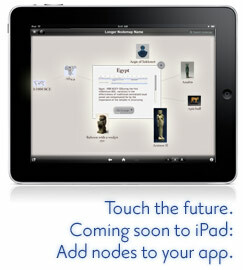 We’re excited about the ways SpicyNodes can enhance your collection when it’s viewed via your app. Richly visual and interactive. Present information in a way that’s appealing and easy to navigate way, and that fits seamlessly with your site or exhibits. Put visitors in touch with your whole collection. Visitors can fly through a directory of your collection, and then zoom in and out for more information. Easy, inviting touch kiosks. SpicyNodes works great on touch screens. Adding these kiosks to your exhibits increases participation and interest. Revitalize a depreciating asset. Lost or buried content on your site is rediscovered. With a SpicyNodes site map or content portal, visitors can easily find their way through hundreds or even thousands of nodes. Reach visitors you are ignoring. 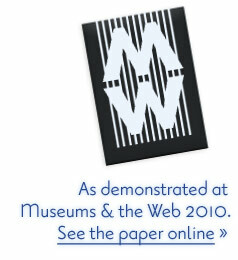 Our recent evaluation revealed that visual and hands-on learners particularly respond to SpicyNodes – an audience that is too often overlooked by museum web sites. Do more with less. SpicyNodes offers very affordable Enterprise memberships, and one-time perpetual licensing is also available.